DOVER-FOXCROFT –After nine years in business. Spencer’s Bakery & Cafe of Dover Foxcroft closed their doors at 922 West Main St. at the conclusion of their lease. Within hours, community members began inquiring at the Chamber of Commerce, wondering what became of their beloved breakfast spot. Though Tom Spencer, the master baker and owner, had plans for retiring in the near future, he knew he wasn’t quite ready to hang up his apron, and began looking for a new location. There was talk of a move to Guilford, which ultimately didn’t pan out, but rumors of a new location continued to circulate. Then, on Nov. 5, a Facebook post on Pat’s Pizza’s page read, “We have some exciting news. Tom Spencer will soon be bringing his talents and breakfast menu to Pat’s Pizza Dover-Foxcroft. Stay tuned for more details.” Within 24 hours the post had been shared close to 70 times and received dozens of positive comments, and once again, calls began flooding in to the Chamber with folks wondering when this would happen and how it came to be. Enter: Bob Ade. Bob Ade is the owner of Pat’s Pizza locations in Dover-Foxcroft and Milo. His arrival in Dover-Foxcroft in December 2012 brought with it an immediate, positive shift in the downtown area, beginning with a very visible facelift to the building at 100 E Main St.
Just this past August, the building was given a makeover with brighter, “happier” colors. In recent years, new banquet rooms were added inside the building on the first and second floor, creating attractive, functional meeting spaces to accommodate events from smaller business workshops to larger parties. Just one look at Pat’s Facebook page and it becomes evident that Bob is an avid supporter of other local businesses, using his social media pages to share information and promote what is happening around him. He works with non-profits and has helped local families in need by hosting fundraising days, giving a portion of his profits from all sales of the day back to those organizations or families. 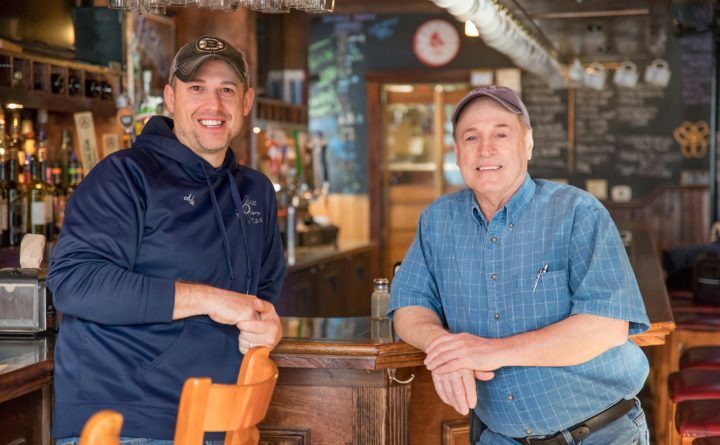 Bob and his manager Eric Thompson had planned on offering breakfast at Pat’s Pizza after Tom Spencer retired, but the abrupt closure of the bakery’s W Main St. location changed the time line. Shortly after Spencer’s Bakery & Cafe closed its doors, Bob and Tom spoke, and it became clear that this would be an amazing opportunity to answer the community’s call to keep Spencer’s alive while bringing breakfast to Pat’s much sooner than planned. Ultimately, this would mean more seating for Spencer’s customers in Pat’s large dining area (upwards of 110 seats), and a much better parking situation than the bakery’s previous location, while potentially bringing in a new customer base for Pat’s. Tom Spencer will be bringing one of his cooks and his menu with him (minus the breakfast wraps), but operating under the Pat’s Pizza name. The new breakfast crew will also consist of a current Pat’s cook and waitstaff from Pat’s current employees and new hires. Currently, Bob Ade has been hard at work re-structuring the kitchen to accommodate Tom’s needs. It is evident that both Bob Ade and Tom Spencer are thrilled about this collaboration and excited about what it will mean for the community.